We’re delighted to have partnered with Nottinghamshire County Cricket Club (Notts CCC) to power Trent Bridge cricket ground. Recognised as an iconic international sporting venue, Trent Bridge is not only the best attended UK cricket venue outside of London, it also holds a global top 10 ranking for spectator experience at sporting venues. Nottinghamshire County Cricket Club will be powered by Yü Energy following the conclusion of a wide-ranging partnership agreement between two of the county’s leading lights. The partnership will see Yu Energy powering the club’s Trent Bridge cricket ground and training ground with the supply of gas, electricity and water, as well as partnering on a range of other energy related initiatives including the provision of mobile phone charging points and future renewable energy solutions for Trent Bridge. The Fox Road Stand has been re-named The Yü Energy Stand as part of the agreement. Yü Energy CEO Bobby Kalar welcomed the deal. “We are absolutely delighted to be partnering with Nottinghamshire County Cricket Club,” said Bobby. 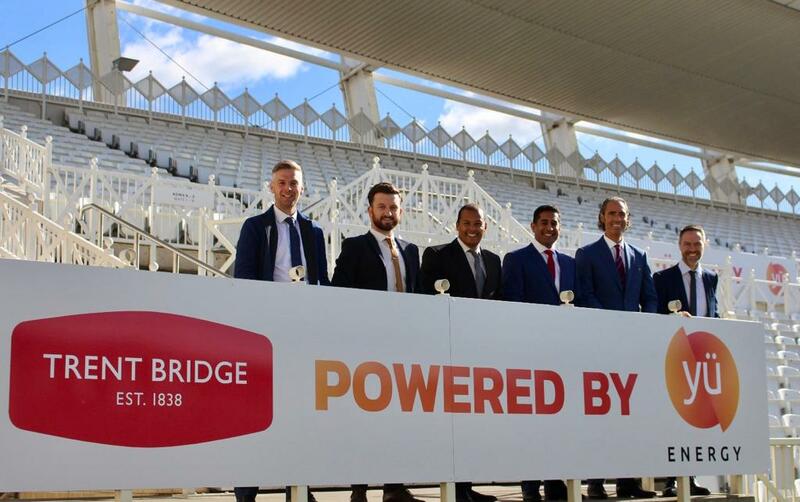 “It’s an honour for Yü Energy to be powering Trent Bridge cricket ground which is such an iconic international sporting venue. Nottinghamshire County Cricket Club Commercial Director Michael Temple welcomed Yü Energy to Trent Bridge. “Our partnership with Yü Energy is a natural fit given their commitment to Nottingham, their national outlook and their commitment to working with like-minded businesses to make a meaningful difference through energy supply,” he said.